As part of his healing process, Larry McGaughey became active in post-9/11 community assistance programs. A UMNS Photo by John C. Goodwin. NEW YORK (UMNS) –– The view from the window of Larry McGaughey’s law office changed after the Sept. 11 terrorist attacks. Gone are the looming towers, replaced by what looks like a construction site. But McGaughey, who fled his office before the collapse of the World Trade Center that day, is back, along with many others in the neighborhood. McGaughey, who serves as chancellor, or corporate lawyer, of the United Methodist New York Annual (regional) Conference, says he has come to terms with the experience of Sept. 11, except for the lingering memory of seeing people jump to their deaths from the Twin Towers. “I still have a difficult time with that,” he adds. The Rev. James K. Law, senior pastor of the Chinese United Methodist Church in Chinatown, has remained at the post he has held since 1993. His experiences related to the attacks –– including days spent at Ground Zero ministering to the rescue and recovery workers there –– eventually led him to seek counseling. The Rev. 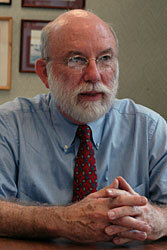 James K. Law’s experiences related to the attacks led him to seek counseling. A UMNS Photo by John C. Goodwin. He also had to minister to the family of Nancy Yuen Ngo, who was lost at the World Trade Center, and other church members. “I had members in close proximity; they saw people jump out of the buildings,” he says. 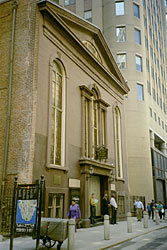 Chinese United Methodist Church, which Law first joined as a layperson in 1978, became “a processing center to help area residents.” The church was one of the satellite sites for the United Methodist Committee on Relief’s New York 9/11 Program and also coordinated locally with the Chinese Staff and Workers Association. 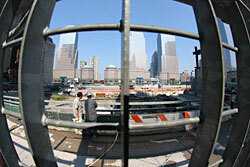 A current view of Ground Zero shows all the wreckage cleared, but rebuilding has not yet begun. A UMNS Photo by John C. Goodwin. 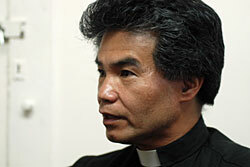 Part of the denomination’s response was to provide counseling services. As someone trained in pastoral counseling, Law recognized the symptoms of what he called “post-traumatic stress response” in himself. He had lost more than 15 pounds because of lack of appetite, for example, and was regularly waking at 4 a.m. each day. So he underwent six months of counseling and journeyed to the international ecumenical community in Taize, France, for prayer and reflection. Law says what helped him was not so much a psychological understanding of the trauma related to Sept. 11 but a renewed consideration of what it means to be a Christian and a pastor. Law finds strength in Chinatown –– a diverse area that includes Hispanics and African Americans as well as Asians –– despite its economic problems. “This is a good place to do ministry,” he says. The Rev. Jason Redmacher could sense the lingering effects of 9/11 when he became pastor of John Street United Methodist Church in 2003. A UMNS Photo by John C. Goodwin. The Rev. 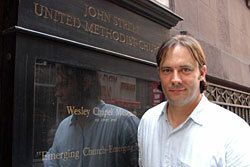 Jason Redmacher could sense the lingering effects of 9/11 when he became pastor of John Street United Methodist Church, just a few blocks from Ground Zero, in July 2003. But he has been a witness to the downtown recovery –– a recovery that also is revitalizing the congregation. When Redmacher came to John Street church in 2003, small businesses were closing “at an alarming rate” in the neighborhood. “There was a despair and hopelessness that went with that,” he remembers. The residential boom has been particularly attractive to young people, and Redmacher estimates that half of those attending worship are between 20 and 35 years of age. John Street United Methodist Church stands just blocks from Ground Zero. A UMNS Photo by Linda Bloom. The renewed congregation is finding a sense of identity in that history, according to the pastor. One of the church’s missions is to host confirmation classes that go to the museum there and to visit Ground Zero. McGaughey says a “tremendous conversion” of the area near his office at 217 Broadway has changed “a big neighborhood of small businesses” into private residences. The large number of tourists also adds a new element to the area. He recently renewed the five-year office lease that he signed Aug. 1, 2001, and says the backbone of the neighborhood, the financial services industry, remains strong.